Warfare in complex terrain demand soldiers to be prepared to operate in open areas and enclosures, in the higher levels of the built-up urban area, or in the underground. The varying scenes are demanding not only to the warfighter but to the sensors used for situational awareness and targeting. 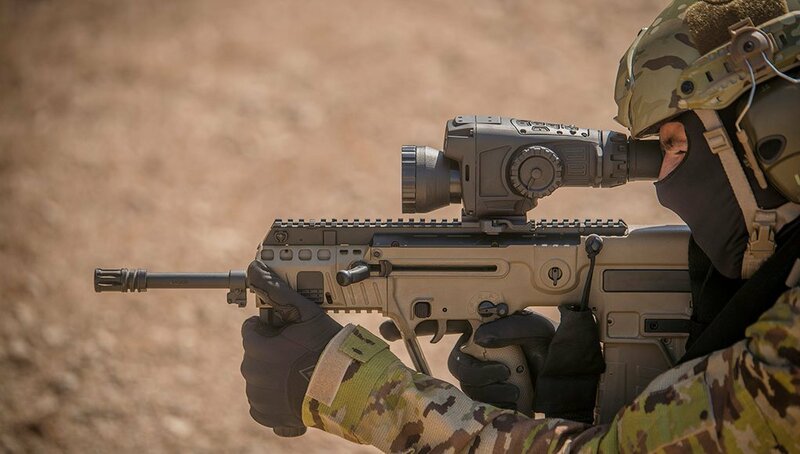 To be able to cope with different situations, and maintain readiness and fighting ability on missions that may span daylight and night time, soldiers often carry multiple sighting systems suitable for each scenario. Additional equipment means more carrying weight and space for devices and the energy they consume, and the cost for redundant sensors. Electro-optics sight expert Meprolight has introduced the MEPRO NYX-200. The device is designed as weapon mounted or handheld ‘all in one’ sighting system that offers military users a common, multi-spectral EO weapon sight that combines an uncooled thermal channel with a sensitive, high-resolution digital day/night camera to provide the user effective situational awareness under all visibility conditions, including total darkness encountered in operations underground. The new multispectral NYX-200 is available in two configurations: the thermal channel with digital night camera or thermal channel with digital day camera. The main channel is the thermal one, using a 640×480 microbolometer core sensor based on 17-micron pixel size technology for high resolution. The secondary channel comprises a low-light camera or day camera, with 1280×640 resolution. The sight is available in two versions, the x1 magnification weighs about 750 grams or an x2 magnification, weighing about 900 grams. NYX200 can run for up to seven hours on four AA batteries. In addition to the vision channels, the device also includes an infrared pointer and digital video recorder to improve team coordination and post-mission debriefing. The combination of thermal channel and digital day camera (DDC) enables the soldiers to use the sight for both day and night operation, eliminating the need to change sights/devices between day and night, and allowing soldiers to move between dark and light environments, such as entering dark places also during daytime. The combination of thermal channel and digital night camera (DNC) enables enhanced situational awareness with a maximum view at any level of darkness in any environment. The thermal channel can be used in total darkness and through the fog, camouflage, etc. The sight’s digital night vision is optimized for Close Quarters Battle (CQB), face recognition, and more.